generally, sandwiches are not something for which a recipe is necessary. bread, condiments, cheese…not usually something that requires much instruction. but sometimes, just sometimes, there comes a combination of flavors & a little bit of technique that goes a bit beyond slapping some turkey between two slices of sandwich bread. all the sophistication of an upscale cheese plate, but with the approachability of your favorite meal that’s meant to be eaten with your hands. 1. preheat panini grill, or grill pan, to medium. brush the bread on both sides with olive oil & place on the preheated grill. grill until golden brown, about 3-4 minutes. 2. divide the cheese among the four bottom pieces of warm bread. top with pear wedges, drizzle with honey & sprinkle with salt & pepper. top with the arugula, equally divided amongst the four sandwiches. top with remaining bread. 3. return the assembled sandwiches to the grill & heat for 1-2 more minutes, until the cheese melts slightly. cut in half & dig in while they’re still warm. This entry was posted in entrees, sandwiches, vegetarian and tagged bread, cheese, fruit, honey, pears. Bookmark the permalink. 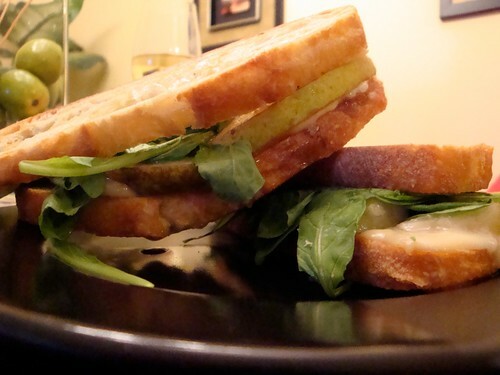 That has to be the most delicious looking sandwich ever…and it looks easy too. I love Giada. Might have to try it this weekend! Thanks for posting!